How Much Do Smart Windows Cost? You’re probably aware that your windows can play a pretty big part in your home’s energy use. Windows stand as a last defense against winds and heating and cooling loss—but the glass can also keep out unwanted solar heat as well. That means you need to pay attention to the energy measurements listed on your window’s specs. You’ll need to look at the solar heat gain coefficient, which tells you how much solar radiation the window allows through the glass. The only problem? That number is a static measurement, so your windows let in or prevent the same amount of solar heat all year. But there are some parts of the year when that sun might be useful as passive heating, so you could use less energy in the winter, too. That idea is exactly why building experts developed dynamic smart glass for windows. These WiFi-connected smart glass surfaces are equipped with environmental sensors that can read room occupancy, weather, and sunlight. Their louvers adjust tints to allow in more solar heat when you need it—and shade your home when it’s hotter out. That means you’ll never have to reach to adjust the shades ever again. The downside is that this high-end technology doesn’t come very cheap. Most smart window products cost at least 50 percent more than their non-automated counterparts—so if you’re installing several windows, they can cost a pretty penny. On the other hand, manufacturers say they can shave up to 20 percent of your energy costs off your monthly bills, so the return on investment might be worth it over time for smart glass windows. Here’s a breakdown of the kinds of smart window products on the market right now, and what you’ll pay for each. As one of the most well-known manufacturers in the smart glass market, View makes luxury glass products with WiFi-connected tint controls. The settings can be managed through an app on an Android or iOS device. View is a luxury smart glass maker, so don’t count on getting their products for cost. They typically custom-design smart glass for a whole interior, which can run tens of thousands of dollars, depending on the amount of smart glass windows you need. Expect to pay anywhere from $50 to $100 per square foot for smart glass windows, as compared to $10 to $15 per square foot for regular glass. Not everyone has the wallet to equip every window in their home with a brand-new technology like smart glass. 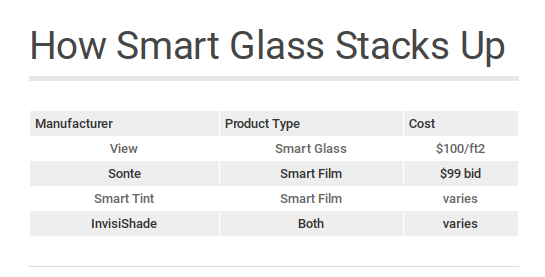 A more cost-effective solution is Sonte Film’s smart window film. This product, known as a digital shade, fits over existing wall surfaces to retrofit your windows with WiFi-enabled tint technology. You can take the smart glass from transparent to opaque by using a control on your phone or device. Sonte requires you to contact them for pricing based on your home, but prices have been listed as $199 and up for a full-size sheet of 3.28 by 3.28 feet. Another adhesive smart film, Smart Tint’s product has been endorsed by Tiny House Nation’s “Smart House.” They offer two kinds of smart film, Smart Cling® Self Adhesive, which adheres directly to existing windows, and Smart Tint Non Adhesive, which can be affixed using double-sided tape. Smart Tint is AC connected, and can tint between transparent and opaque—and it can even be used as a projection surface. Installation is completed by a Smart Tint professional, and prices vary depending on the size of the space. However, a 31.75 by 49.75 inch window order costs about $649, according to their order calculator. InvisiShade’s smart glass can be controlled using a switch on the window or through a remote control. They offer a wider selection of colors and styles—but if you’re not feeling new windows, you can order one of their plug-and-play adhesive film kits and transform your windows into a digital surface. Each kit comes with a remote control and a wiring kit. A sample kit for the self-adhesive film will run you around $99—or $249 for a three pack if you want to try different colors. InvisiShade’s final prices are variable depending on the size and scope of your project, but they do say they offer discounts for bulk purchases—if you’re redoing your whole home, for instance. Like most home repairs, the final cost for smart windows depends vastly on the quality of the product you choose (smart glass or smart film) and the amount of materials you need to get the project done. You’ll get a better discount if you choose to cover more surface area in your home, but just like any window, smart glass is an investment. If you can wait to install this technology in your home when it’s just a bit more advanced, you’ll probably save money, as well. 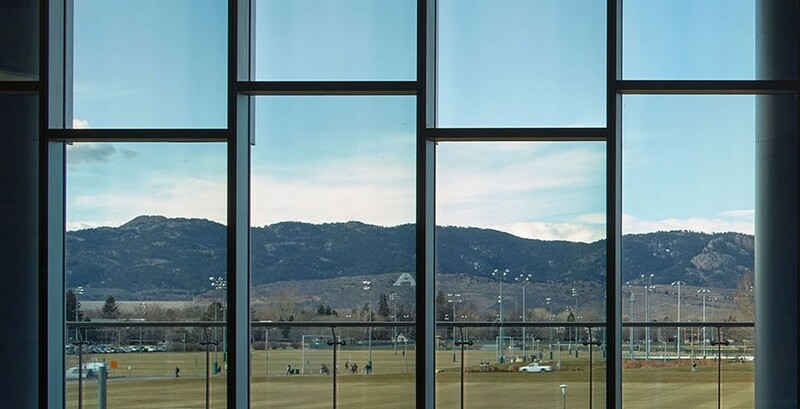 While a lot more testing needs to be done to understand the specific benefits, most experts agree that smart glass windows have the potential to save you a lot of excess energy—which also means saving money on your utility bills. Shades and blinds just aren’t a practical (or particularly advanced) technology to prevent solar heat gain, so having a more precise system could do a lot of good here. And if you’re one of those people who can’t stand the look of conventional blinds, you may enjoy the blind-free views that come with the installation of smart windows by a reliable window replacement contractor. On the other hand, this technology is still developing, so there are still kinks to work out. Most smart home products suffer from compatibility and user interface issues that make their setup and functioning difficult—at least for the time being. And as previously noted, there’s an issue with cost. Technology prices tend to fall as demand and availability increase, so if you’re interested in this technology, you may want to wait it out and see where the industry goes. After all, you don’t want to be stuck with the window equivalent of the LaserDisc when the DVD comes out. No matter what kind of windows you choose for your next replacement project, taking into consideration how your glazing affects your home’s energy performance is a good place to start. Energy saving windows are always a “smart” bet.